Tork ® and its parent company, SCA, have a long and proud history of looking after the forests and the environment. That position was strengthened recently when SCA Sustainability Director Hans Djurberg was elected to the board of FSC® International. FSC (Forest Stewardship Council) is the most important and recognised platform for dialogue on forestry, both globally and nationally. The international board consists of nine members representing environmental, social and economic interests from developed and developing countries. "I am very proud to have been elected, and it is of great importance that the forest management and industry structure we represent has a voice in FSC's senior management," Hans said. "It is critical for the viability of the system, that forest owners and forest based industry participate actively in shaping it for the future". Hans has extensive experience from the forest industry and forestry, including Chief Forester at SCA in Sweden and prior to that where he was responsible for quality, social, environmental and forestry conduct in the IKEA supply chain globally. He sees three challenges for FSC in the coming years: to strengthen FSC's credibility among stakeholders and the market; to manage FSC's rapid growth; and to make FSC relevant to different types of forestry, particularly for small forest owners. Winning representation on the board of FSC International comes at a critical time of change when countries around the world are officially recognising the importance of sustainable forestry practices. In mid-November, the Australian parliament passed laws to ban the import and trade of illegally logged timber, joining the United States and European Union in clamping down on a global trade in stolen timber that Interpol says is worth about $30 billion a year. SCA take forest stewardship and FSC certification seriously. As the world’s largest producer of FSC labelled products they can proudly say that their entire forestland is FSC certified. 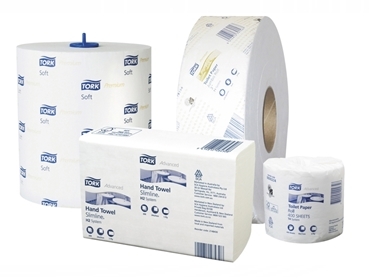 Tork was the first in Australia and New Zealand to offer a full range of FSC certified washroom and wiping products. In addition Tork has the largest number of third party ecolabel accredited products in the market. These environmental accreditations help you identify products that have a reduced impact throughout their lifecycle. Such positive changes mean the future for our forests is looking greener every day.